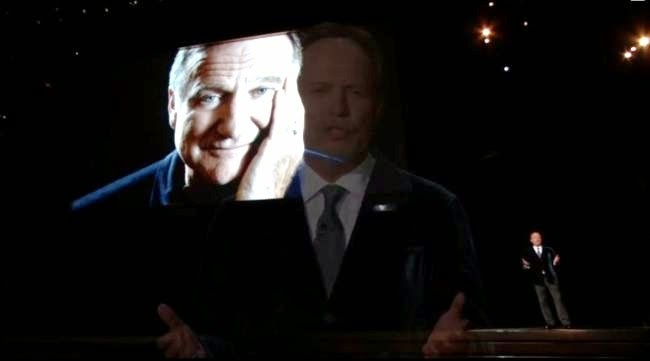 Billy Crystal honoured ‘the greatest friend you could ever imagine’ as he made his emotional tribute to Robin Williams at Monday night’s Emmy Awards. They were best friends as well as co-stars and when the When Harry Met Sally star paid tribute to Williams, he had the Emmys audience in tears. ‘He made us laugh. Hard,’ Billy began. ‘Every time you saw him – on television, movies, nightclubs, arenas, hospitals, homeless shelters for our troops overseas. And even in a dying girl’s living room for her last wish, he made us laugh. Big time. ‘I spent many happy hours with Robin on stage. The brilliance was astounding. The relentless energy was kind of thrilling. I used to think if I could just put a saddle on him and stay on him for eight seconds I was going to do OK.
‘He could be funny anywhere. We were such close friends. He would come to all our great family functions – weddings, Bar Mitzvahs, that kind of thing, and he’d sit with my older immigrant relatives like he was one of the guys,’ Billy continued, adding how Robin would pretend he had come to America from Poland. ‘As genius as he was on stage, he was the greatest friend you could ever imagine – supportive, protective, loving. It’s very hard to talk about him in the past because he was so present in all of our lives. ‘For almost forty years he was the brightest star in the comedy galaxy. While some of the brightest of our celestial bodies are actually extinct now, their energy long since cooled, but miraculously, because they float in the heavens so far away from us now, their beautiful light will continue to shine on us forever. Billy’s moving speech was followed by a myriad of clips of Robin’s TV appearances. As well as co-starring in 1997 film Father’s Day, Robin and Billy co-hosted charity telethon Comic Relief for many years, also giving an unscripted performance in a 1997 episode of Friends together. The In Memoriam segment also included a performance of Smile from singer-songwriter Sara Bareilles. Robin was found dead in his California home on August 11.